It was a grey, wet evening on the West Coast, and I was watching a marvelous display of dauntless enthusiasm. I was guest-coaching a squad of junior women, watching them chase the disc through the rain. Back and forth they went, like waves crashing together under bleak skies, and the disc advanced in inches. Only through a marathon of effort did the disc make its way toward the endzone. For all the effort being poured out on the field, it lacked a decisive form or function, and much of it went to waste, hammering footprints uselessly into the mud. That had to change. I chewed my lip, considering how to put it into words. Sheepish grins and shrugs confessed their guilt: they had intuited as much, but had not found their own solution yet. Early on, coaches commonly teach cutting by describing it through examples and tools of misdirection. We typically instruct players to first run one way, then double ­back the other way, with varying philosophies about which direction is the higher priority. When the defense becomes slightly stronger, we add garnishings–like varying speeds, inserting a quick fake, or taking a stab step at the defense, forcing them to turn or to backpedal. Maybe we mention starting close to the thrower, so that a huck becomes more threatening, and thereby making it easier to get open on secondary cuts. But as we mature as players, and the defense grows more agile, more aware, and more disciplined in denying priority areas, these directives yield diminishing returns. And when they fail, the effort goes to waste. In this approach, we are often describing tools–the how–without really describing the why behind them. These tools are important, of course, but the tools do not by themselves get the job done. To throw them indiscriminately at the problem is trusting your luck or your raw athleticism, just as much as skill. It works, and sometimes reasonably well, but it’s not a strategy. To build a very consistently successful offense, one must understand the use of the tools, the properties you manipulate with them, and the master plan to which you’re building. Everyone can agree on the principle, but imparting genuine understanding is tricky business. In that spirit, this is not an article about footwork tips, drills, moves, or set plays. It’s about the properties of the field — the underlying geometry that governs how people ultimately become open in different ways. And on that structure, you can use whatever tools to get the disc you like best. For those of you struggling to get the disc by design, I hope it proves useful. The more space there is in front of the thrower, the more likely you will get open. When you haven’t got enough space to get open easily, give what you have to someone else. Most essentially, cutters should regard space as currency. Space has value on the field as both a means (a place in which one can become an open target) and an end (a place where the offense can create fresh opportunity). Together and separately, cutters must trade, budget, and spend space in order to pose threats, and ultimately make a successful attack. Consider the space available to the isolated cutter in Figure 1A. By virtue of the space alone, this cutter occupying it can make viable threats to the open side, the deep strike, and to the break side in any particular order, and the blocking of one cut effectively ensures the success of the next (if one is denied, then another becomes open). The force applied by the marker is almost immaterial, since there is enough room that a decent thrower could make a variety of leading passes around or over the mark as needed. Gaining the disc anywhere in this space also leads to equally good opportunities for a teammate to become open. In comparative poverty, the cutter in 1B can only work within a narrow sliver of a lane where only one throw type is possible (mechanically speaking, an edgeless forehand), and a break-side throw is nearly impossible. Although still isolated in a technical sense, he can only hope to make threats along a very straight line between the open-side under and a difficult strike along the sideline. I like to speak of space in quantities of equity for these reasons. Space is always abundant on the field (3650m2 of it!) but very little of it amounts to useful space at a given time. I specifically attach numbers to these spaces because quantities give value that abstractions cannot. I define a block of useful space as a contiguous area occupied or belonging to a single cutter (whether upfield or back), and within 50% of the thrower’s maximum range. By this definition, cutter 1A is enjoying close to 900m2 in which to act, and 1B is trying to make do with less than 350m2. The reason for these constraints is that such blocks describe the spaces in which a cutter can practically move about and set up an attack. Although the cutters in 1A and 1B can theoretically lay claim to the entire endzone, these are not spaces available to them to set up; as you approach the upper end of the thrower’s range, you become less of a viable target, and your only threat becomes an in-cut. With the concept of space equity defined, the ideas of sharing, trading, and investing follow naturally. Twenty dollars is a reasonably useful quantity of value, and provides spending options that two dollars does not. The same is true for spacing: cheaper spaces lead only to cheaper cuts. I like to say that 350m2 (400 square yards for the American reader) is the minimum useful space a cutter needs to get open by design. This can come in many shapes–a lane’s width in a horizontal stack, a lateral strip in an endzone offense, or even a squarish area behind the thrower for a dump. But experience has taught me that the average cutter needs at least this space to reliably work his art. This is true in part because large spaces innately offer more threats, but also because every manoeuvre or fake a cutter may try, like dashing at the defender, will use up some space. A cutter’s arsenal of “moves” burn width and length like currency, and the richer you are in space, the more you can afford to spend in preparing a cut. It follows, therefore, that if you haven’t got a reasonable amount of space, you should donate it or trade it with a teammate knowing that something more useful might come of your combined equity. To that end, teammates must be willing to maintain an economy of spaces. The cutter in 1A has been invested with a huge area in which to work, which makes it a popular pull play. But pairs of cutters running mirrored cuts can also effectively “trade” spaces if they so desire, making the most out of their real estate, and this also proves effective. The concept remains the same, though: a cutter must be allowed at least 350m2 to outmanoeuvre good defense. The most powerful place on the field is a spot where you can make three distinct, equally strong cuts. When you want the disc, this is where you should start your cut. The first advantage of space, as alluded to above, is the ability to offer threats. Good defenders will block access to one viable threat. If you’re positioned to attack in two directions, defenders need to take a more compromising stance. With three threats, your defender will be overstretched and reactive. In Figure 2, I have sketched out a map of “threat number”–the number of discrete attack types a cutter can make from a given place. 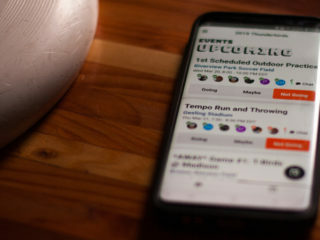 For some, this is already intuitive, but it is a fundamental worth committing to paper. A good defender can only be defeated when he or she needs to juggle priorities that require different stances. Note local peaks and “high ground” in the numbers: places where the cutter gains opportunity and advantage. In these places, defenders need to worry about two distinct cuts to the open side (a “near” open side, and a “far” one) both within easy reach. This region forces the defense to compromise — commonly, by turning their hips — to balance the number of threats. On the other hand, if the cutter were to start in the middle and simply “cut one way and then the other,” a good defender would never react by changing his stance. By moving into a triple threat position, a cutter forces a defender to alter his footwork. Although Figure 2 shows the example of an endzone offense, the same accounting of threats applies to horizontal stacks, split stacks, and dumps. As an exercise, consider the isolated cutter of Figure 1A and the threat number at every point in the square. I have already moved the cutter into a local optimum–not every point in a valuable space is equally valuable, as many cutters who have struck deep too early can affirm. Set up your defender by moving him into a place that leaves him exposed relative to how the disc is moving. 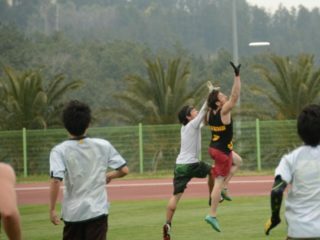 Time your movement so that he cannot see where the disc is caught. Make your attack there, when he isn’t sure where the threats are. Lastly, a cutter should remember that a good defender’s best resource is his information. Defenders observe the field to (i) see the disc position, (ii) see the possible throws, (iii) anticipate the next play, (iv) prioritize threatening spaces. If a defender has access to information at regular intervals, he can continually reposition himself to optimize his footwork and hamper access to the most desirable spaces before they become available. When a cutter moves, he occupies some of the defense’s attention. If he moves into a place where he offers one or more new threats, particularly as the disc moves to a new position, then he compromises the defender’s information at a critical time. Specifically, he should draw the defender into a position where he needs to reconsider his footwork because of the threat number. This act is the most important component to the “good timing” coaches talk about. A well-timed set-up can allow a cutter to capitalize even on a threat number of 2, and it is how good cutters can manage to repeatedly get the disc in uncomfortably narrow lanes, as illustrated in Figure 3. 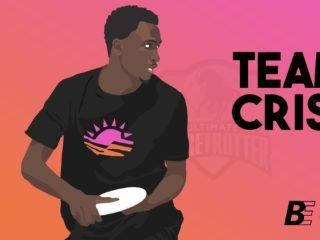 By timing a move into a threatening position at the same time as the disc is about to be thrown or caught, one vastly elevates the odds of success in whichever attack the cutter chooses to make. This is true for a very simple and intuitive reason: the defense can know he faces multiple threats, but if he does not know their relative severity, he cannot make a good judgment of how to position himself.